It’s been a busy year for browser vendors. Microsoft released IE8, Google Chrome is at version 2, and both Firefox 3.5 and Safari 4 are imminent. 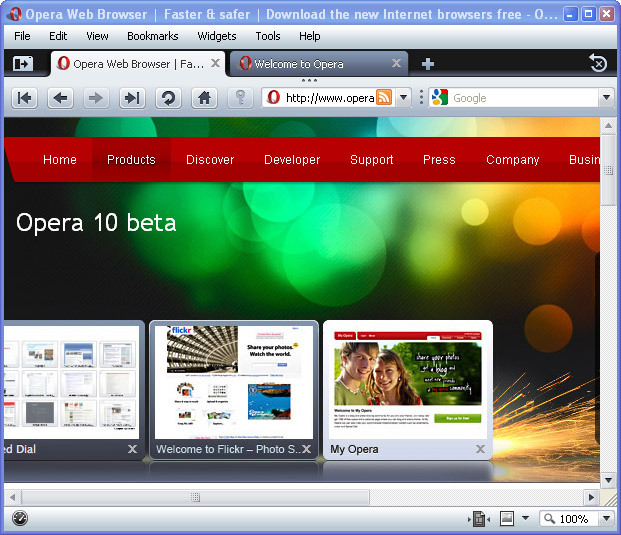 However, the latest new browser is Opera 10, which is now available as a beta download. Opera has a reputation for leading innovation and web standards whilst remaining lightweight, fast, and feature-packed. The installer is a fraction of the size of most, but the browser includes tabs, speed dial, an email client, RSS reader, newsgroup support, IRC, a bit torrent client, notes, mouse gestures, desktop widgets, developer tools, small-screen rendering, and more. Yet, although it is popular in Northern Europe and Russia, it languishes behind IE, Firefox, Safari and Chrome in most of the world. Like many developers, I have a lot of respect for Opera. I use it for testing but it has never superseded Firefox as my default browser. Can Opera 10 persuade me to switch and grab a larger share of the PC browser market? At first glance, Opera 10 bears more than a passing resemblance to Safari. The interface is cleaner, sleeker, and less cluttered. All the features and interface options are still available, but they do not feel as daunting as previous versions. The tab bar can also be expanded to show “visual tabs” with a page thumbnail. Whilst it uses a fair amount of screen estate, it’s a great feature for tab-novices or those with larger monitors. The email client now supports HTML and rich text messages, although that has led to some complaints on the SitePoint forum. I’m not a big fan of graphical email either, but we appear to be in the minority. HTML support is a sound business decision and should lead to more Opera email users. I’d certainly recommend it for netbooks or older devices with limited memory. Standards support is as strong as ever in Presto 2.2, Opera’s rendering engine. 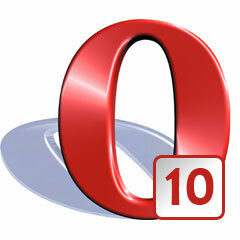 Unlike the majority of it’s competitors, Opera passes the Acid3 test with a 100/100 score. web fonts with support for the CSS @font-face declaration. support for opacity within RGB and HSL declarations, e.g. background-color: rgba(255, 0, 0, 0.5) will create a 50% transparent red background. However, unlike the single opacity property, it will only change the transparency of the element’s background – not the content or child elements. CSS-like DOM element selection with document.querySelectorAll() and document.querySelector(). improved SVG support with web fonts and frames per second settings for animations. Opera’s development and debugging console, DragonFly, has been updated and includes more Firebug-inspired features such as DOM editing and HTTP profiling. Have you tried Opera 10? Would you consider switching from your current default browser?